Any Christmas one off special needs to have all the elements viewers would expect from Steptoe and Son and in that respect this episode delivers. Arguments, heart attacks, emotional blackmail and laughs, everything is there. This seasonal episode starts off with a typical Steptoe storyline. Harold is once again trying to go on holiday on his own, the only added problem this time is that he wants to do it over Christmas. The opening titles show us Harold out with the horse and cart driving down a typical English high street. He pulls over to one side or the road and manages to find a coin for the parking meter. Meanwhile we are taken to the inside of a travel agent shop, where a rather obsequious agent, played by the excellent Frank Thornton is doing his best to woo a rather well to do couple from Epsom. They are interested in getting away for Christmas, they rather fancy the Hotel Mirimar, Puerta de le Vallarta, Majorca, however they are concerned that a number of Rif-RaF…. er working class people go there. Harold has arrived in the shop and is standing at the counter with a very big smile on his face. He is undoubtedly excited. The agent asks the couple to excuse him and calls Harold over to him for a discrete word “The dustbins are in the Alley at the back” !! !The first huge laugh of the episode but certainly not the last. Once again we are living Harold’s dream with him and hope that this time he can finally get what he wants, especially given the very snobbish and disdainful behaviour of the Epson couple, whose worst nightmares are realised when they discover that not only is Harold staying at the same hotel but even worse he is in the next room. But deep inside ourselves we somehow know that this episode will be played out in Oil Drum Lane, in wintery Shepherds Bush and not the sunny Balearic Islands. There are nevertheless some excellent moments during the Travel Agent scene, perhaps the best moment being the expression on Frank Thornton’s face as he licks his finger after trying to separate and count a very grotty looking was on pound notes. While this is all going on we are treated to a view of Albert “decorating” the Steptoe home for Christmas. 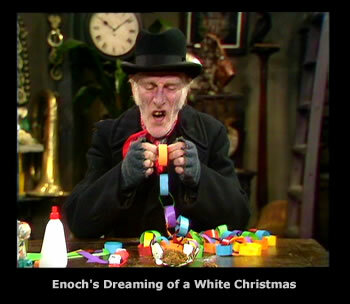 Albert is making paper chains and to get himself into the Christmas spirit he is singing a song that was highly relevant for 1973 “Enoch’s Dreaming of a White Christmas”. Other concessions to the season are adorning the Skeleton with a paper hat and cigar and exchanging the Steptoe version of lavatory paper – cut up newspaper, with cut up Christmas wrapping paper, “A bit shinny, but festive” as Albert puts it. There is a touching moment as Albert starts to decorate the tree. The fairy was first bought for Harold’s first Christmas and as Albert puts it, “they have seen him grow up together”. 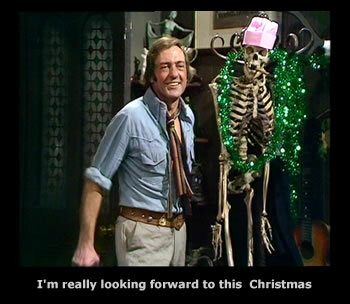 As he puts the fairy at the top of the tree he starts to talk to her recalling part Christmases in the Steptoe family. Their reminiscences are interrupted by a cry of pain from the Khazee. Harold has found the Holly Wreath that Albert inadvertently left on the toilet seat. Back in the house Albert begins to explain everything he has done to prepare for the big day. Without pausing for breath he lists the various booze he has ordered along with various other essentials. He finishes by stating that he has put the Christmas puddings on to boil explaining that they are as black as a gorillasgoolies. Everything comes to a crashing halt when Harold drops his bombshell that he won’t be there. Again we are back into classic Steptoe with the old man playing every trick in the book to make Harold stay. Albert accuses Harold of not considering how he was going to have to spend his Christmas. In response Harold produces a ticket to the Old Peoples Christmas party being organised by the Vicar, however Albert is having none of it, refusing to go so as not to cause Harold embarrassment ? When asked what he will do instead Albert raises his eyes upwards and explains that “I’ll go down to the cemetery and sit with your mother” ! Albert now feels he now has nothing to live for and that this is likely to be his last Christmas. He is suddenly feeling very tired, and makes his way to bed. There is just enough time to “accidentally” drop a bottle of pillsand suffer a mild heart attack before leaving Harold on his own with his conscience. Of course Harold relents as we knew he would. Ironically Harold also knew he wouldn’t be going. However he is still determined not to spend Christmas on his own with just Albert for company. He is going to cash in his holiday ticket and blow it on the biggest party that has ever been held in the Steptoe household. Once again our optimism rises as the next scenes show the Steptoe’s in a much more lavishly decorated house, preparing for what is going to be a party on a very grand scale. Spirits are high, especially after a couple of glasses of very pungent punch made in a china poe. However again as always, circumstances conspire to ensure that the Steptoe’s have a truly poxy Christmas.